ABSOLUT HELSINKI is on the inside back cover of the 4/00 issue of Elle Decoration magazine (British Edition). 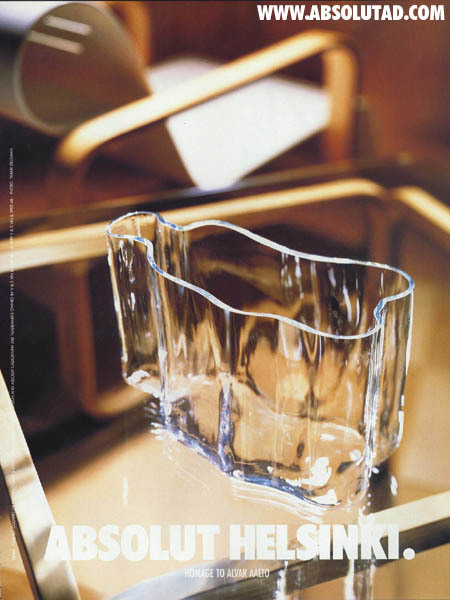 This 1999 ad is similar to the one found in the 3/99 issue of Scanorama magazine; it shows a crystal vase, in the Absolut shape lying down, created exclusively for this ad. Frank Dilleman photographed the ad. TBWA and the information typical of a European ad are printed up the left margin. Alvar Aalto is a famous Finnish architect and designer who created a famous Savoy vase in 1936, which captured the spirit of Finish design and symbolized Helsinki, the cultural heart of Finland. Today, that vase has been re-interpreted by master glassblowers, combining the simple flowing curves of Alvar Aalto's vase with the Absolut shape "to produce a new icon of pure transparency", which is the beautiful vase used in the Absolut Helsinki ad.